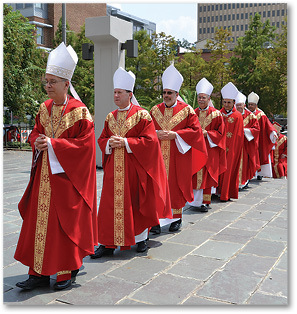 St. Joseph Cathedral was “bursting at the seams” in terms of numbers of people, prayers and well wishers for Bishop Michael G. Duca, who was installed as the sixth bishop of the Diocese of Baton Rouge on Aug. 24. To assist the large group of people descending on the cathedral, five buses transported people bubbling with excitement from the Catholic Life Center to the installation Mass. The cathedral was filled well before the 2 p.m. Mass with people from around the state, and beyond including Bishop Duca’s friends, relatives, representatives from all the church parishes, ministries, priests, deacons and religious and families. The ceremony included rich symbolism, music people described as divine, and most importantly, and what the virtue bishop strongly encourages people to have – hope. Among the attending priests was Father Michael Thang’wa FMH, pastor of St. Mary of the Pines in Shreveport. Bishop Duca ordained Father Thang’wa, a native of Kenya, as a transitional deacon in 2009. Father Thang’wa, who is vicar general for his order, Franciscan Missionaries of Hope, said all four priests of his order serving in the Diocese of Shreveport were among many priests from his diocese in attendance. “We have a history with the (Shreveport) diocese, so when I had an opportunity to see Bishop Duca be ordained here, I was happy to go,” said Father Thang’wa. He described Bishop Duca as good and generous in serving the people of the diocese and supporting the religious and seminarians. “He has a love for people and has an appeal to the people as a shepherd to the Diocese of Shreveport. He has the ability to listen to and really care about people and what they are talking about. He listens and responds well,” he added. Father Thang’wa considers Bishop Duca a “great, great” friend. “He opens his heart and is forthcoming,” said Father Thang’wa. He said because Bishop Duca is coming to a diocese with a larger Catholic population, he is praying for him, and he plans on keeping in touch with him. “I’ll come visit,” smiled Father Thang’wa. Carol and Glenn Hymel of Vacherie said the Mass was “beautiful” and filled with a diversity of people. Glenn Hymel, who will be part of the permanent deaconate class of 2021, said he left the Mass filled with hope. 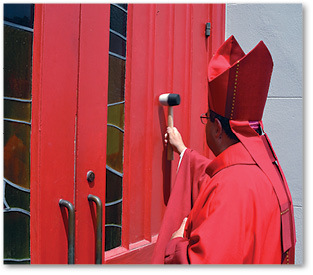 “The church of the Diocese of Baton Rouge is able to go beyond all the troubles in the church and come together and still celebrate in such a holy way. There’s still hope for the future,” said Hymel. Cuong Vu and Kim Mai of Sts. Anthony and Le Van Phung Church in Baton Rouge, said they attended the Mass because they wanted to pray for Bishop Duca and were excited to attend their first bishop installation. They rode the bus with their son, Deacon John Vu, who was recently ordained a transitional deacon for the Diocese of Baton Rouge. “The reading of the papal bull was really impressive,” said Cuong Vu. Kim Mai liked how the representatives of the church parish communities greeted Bishop Duca during the Mass. He said everything, from the music to Bishop Duca’s homily to the feeling of welcome in the cathdral, “fell together” for the Mass. 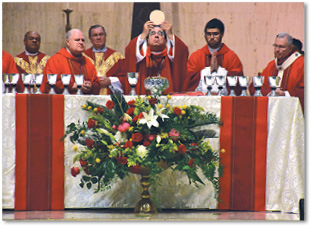 Ruth Fleming, of St. Benedict the Moor Church in Bertrandville, liked the way Bishop Duca emphasized in his homily that the Catholic Church is one holy and apostolic church and the place where people can gather around the table of the Eucharist and receive the body and blood of Jesus. Smitha D’Cruz, a member of St. Jean Vianney Church in Baton Rouge, said it was a joy to bring up the holy water during the Mass. “He was very kind and friendly,” said Cruz, who had an opportunity to meet the bishop before the Mass. 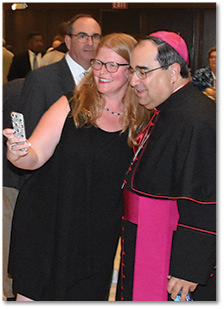 Kaitlyn Landry, a senior and chaplain of the student body at St. Michael High School in Baton Rouge who represented the educational apostolate, now smiles about her invitation from the school to meet the bishop during the Mass. She said meeting the bishop was “awesome” while conceding that she didn’t know what to say. Landry concluded that she also felt particularly blessed by the number of priests and religious who attended the ceremony. “It was good to have all the priests and the bishops. I felt the holiness in the room,” she said.